This is another classic of the Anglicised Indian restaurant and another dish which is generally misunderstood and not often served in any sort of traditional way. It is regarded by most as a mild dish and so it is in most Indian restaurants in the UK. But this is not necessarily the case, biryani and particularly lamb biryani has a long and rich history. Biryani was brought to India by the Moghuls in the early 16th century and so is originally a Persian dish - and indeed there are Persian (Iran/Iraq) variants. Lamb biryani is a very typical version of this dish. For two centuries the Moghul empire ruled a vast amount of the Indian subcontinent, however as it began to crumble new powers came to the fore. One in particular was the Nazims of Hyderabad who split from the Moghul empire in 1707. They became the wealthiest people in the world and ruled the Hyderabad state until Indian independence in 1947. They were connoisseurs of pretty much everything; literature, art, jewellery and, of course, exquisite food. Amongst other dishes the Nazim's kitchen were experts in biryani and prepared about 50 different varieties of biryani and of course lamb biryani would have been a favourite. Biryani can be made from almost anything; lamb, goat, chicken, fish or vegetables to name but a few. The recipe I will give here is of the Hyderabadi style and is a lamb biryani; I will put some other variants on the site at a later date, both for different regional styles and different ingredients. It should also be noted that there are two distinct styles of preparation for your lamb biryani, kacchi and pakki. Kacchi means 'raw' and that the meat and rice are cooked together. In the pakki style, the meat is cooked first and then the put together with cooked rice - this is quicker and a little easier but the results are not so juicy, there is less time for the flavours to mingle, and it is regarded by some chefs as a bit substandard. Here we will use the kacchi procedure. I know this seems a little complicated - it's not really and it's worth every minute to produce a perfect lamb biryani. Meat. Traditionally 'lamb biryani' would probably be goat mutton but for some reason most supermarkets don't seem to stock this, so I usually use lamb You can buy mutton and even goat mutton from a good Halal butcher or from the internet. Ideally it should be largish chunks of lamb rather than the standard diced lamb you can buy. This cooks for quite some time so it need not be a really good cut. Chillis. I use 2 medium size, medium strength chillis in this and this is OK for me - adjust to suit. Chilli powder. I use about ½ teaspoon in these quantities. Whole Garam Masala. This is just a mixture of whole spices. I use 1 black cardamom, 5 Green cardamom, 5 cloves, a few bits of cinnamon and ½ teaspoon coriander seeds. Ground garam masala. Again you can use your own recipe or use a ready mixed one. Salt. I know some people are paranoid about salt but it really is important in this dish. You need about 1 teaspoon to marinate the meat and some more for cooking the rice. Saffron or Turmeric. If you are going to do this really properly then you need to make saffron water (a few strands of saffron in about 2 tablespoons of hot water and use the coloured water when it has cooled). However saffron is both difficult to find and remarkably expensive when you do find it. It is OK to use about ¼ teaspoon of turmeric in 2 tablespoons of hot water. Oil. 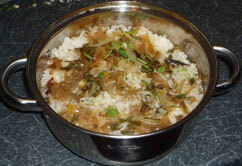 Lamb biryani is best cooked in ghee or mustard oil, you can you good rapeseed (canola) or sunflower oil if you have to. Finely slice the onions and fry in some oil until soft and just starting to brown. Cut the meat into nice big chunks and put in a non metallic bowl. Rice. You can soak the rice first and then rinse if you like - this helps to get rid of excess starch. The idea of the two layers of rice is that the bottom layer will cook more in the pot and this stops it getting too sticky. The pan. Because this cannot be stirred whilst it is being cooked the pan must have a thick bottom otherwise the meat will stick and burn. If you don't have such a pan then a neat trick is to put a frying pan on the hob and sit the pan in the frying pan. Oil. If you use mustard oil then heat it till it just starts to smoke, if using any other oil then it should not smoke. If you don't have a tight fitting lid then you can make a good seal by making a dough (just flour and water) rolling it out and making a seal round the edge of the pan and then covering with whatever lid you have. Alternatively (and what I sometimes do) you can fry of the meat in a pan and then transfer to a slow cooker and continue from there. This works very well for me. Eat lamb biryani with a nice cucumber raita and maybe some sort of vegetable pakora. In Hyderabad, a typical accompaniment is Mirchi ka salan which is a sort of chilli and peanut curry. The quantities suggested here will serve between 2 and 4 people depending on appetite and what you eat with it.